Immigration Planner is closely following the changes that might be implemented by USCIS regarding which family applicants could be considered a Public Charge, and the associated impact on the Affidavit of Support. On October 10th, 2018 USCIS published its proposed new rule called ‘Inadmissibility on Public Charge grounds’ and asked for comments. The ‘comment period’ ended on December 10th, 2018 with more than 200,000 comments submitted. The next step is for USCIS to review these comments, publish a ‘final’ rule, and decide on an implementation date. It is unclear when exactly these steps will take place but at this point Immigration Planner does not anticipate a new Public Charge rule to be implemented before the summer of 2019. What would proposed rules do? Switch the focus of the Affidavit of Support away from the Financial sponsor and would make the applicant’s age, health, family status, assets, resources, financial status, education and skills the center of attention. Make the Affidavit of Support step harder for family applicants because of numerous ‘technical’ changes to the process. The goal of the first step is to determine the income that the sponsor needs to be able to maintain. This goal is primarily based on the number of people the sponsor will be financially responsible for (the ‘household size’). First, based on USCIS definitions, you need to determine what is the Petitioning sponsor’s ‘Household Size’. The Household Size includes the applicant(s) on the Form I-130 the Affidavit of Support is associated with. Then, based on Petitioning sponsors’ geographical location and military status (if any), we can determine the Petitioning sponsor’s income target using the latest official ‘U.S. Poverty Guidelines’ used by U.S. immigration agencies. 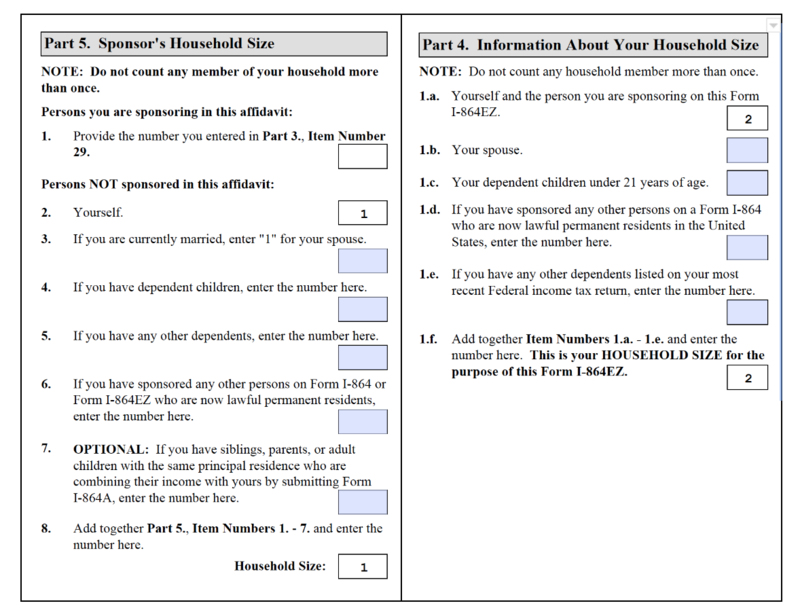 Beyond the income target, the result of this step is for you to be able to complete accurately this section of the Affidavit of Support form for the Petitioning sponsor (in later steps, we will examine which of these two Forms you will eventually complete, but we do not need to worry about that now). 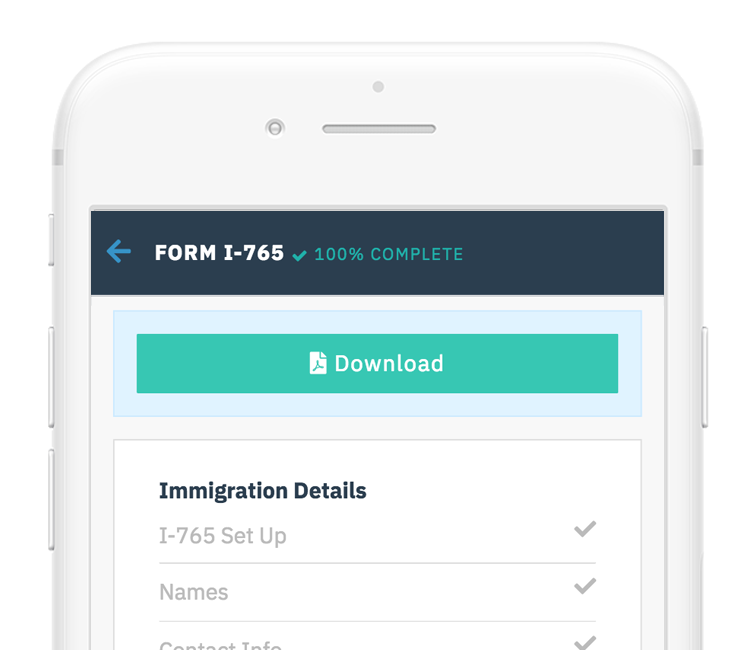 Immigration Planner software helps you avoid common but crucial mistakes ensuring you have the right count of all the dependents to determine your Household Size. Count the Petitioning sponsor as 1. Count the number of people who are on the Form I-130 associated with this Affidavit of Support. If the applicant is an ‘immediate relative’, this number has to be 1. If the applicant is under a family preference, there might be a principal applicant plus derivative applicants. Do not count other relatives you might sponsor through separate Form I-130s, even if you file these I-130s at the same time. If the Petitioning sponsor is married, and this affidavit of support is not associated with a spousal I-130, count 1. Count the number of children whom the Petitioning sponsor claims on his or her most recent U.S. Federal Tax Return. If the Petitioning sponsor has any other children who are unclaimed in U.S. taxes, there is an additional count to be done here. Add them to your count. Count any other person who is not a child, and who is claimed by the Petitioning sponsor on his or her most recent U.S. Federal Tax Return. If, excluding the present Affidavit of Support, the Petitioning sponsor has ever filed an Affidavit of Support before (as a sponsor, joint sponsor, or substitute sponsor), there is an additional count to be done here. Count the number of people included under the prior Affidavit(s) of Support. Subtract any people who has been counted before in this Household Size effort because they are the spouse of children of the Petitioning sponsor. Subtract any people who became U.S. Citizens, or have 40 quarters of Social Security coverage, or are no longer LPRs and departed the United States, or died. If you are a bit confused, you are not the only one. Take 10 to 15 minutes of your time to answer the questions in our software. We have designed a series of simple questions to get you to an income $ number, as well as the numbers you need to write in the ‘Sponsor’s Household Size’ boxes of the Affidavit of Support form. 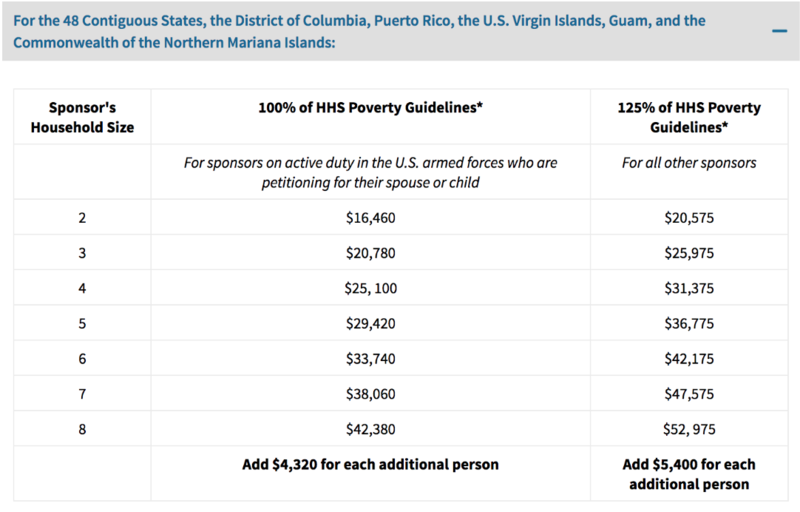 Once you know your Household Size, you need to lookup the ‘right’ number for the Petitioning sponsor (number might also be increased if the Petitioning sponsor lives in Alaska or Hawaii, or be decreased if the Petitioning sponsor is a member of the U.S. armed forces). Petitioning sponsors who have enough income have to be Financial sponsors. Others have to look for joint-sponsors, or assess other strategies. 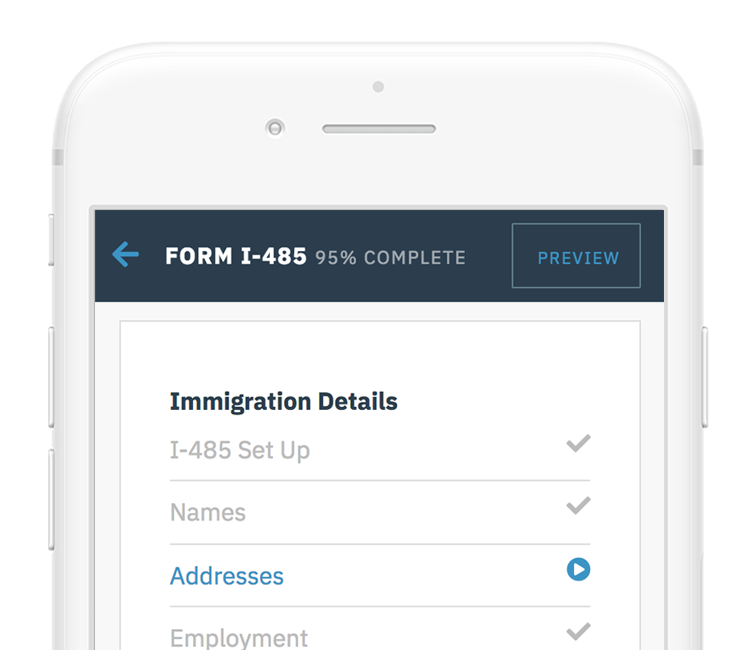 The outline of Immigration Planner methodology should help you identify a Qualifying Path. First, check whether the Petitioning sponsor earns enough income to meet the income target. Petitioning sponsors who meet the income targets have to file for their family applicants. They cannot rely on joint-sponsors. When the Petitioning sponsors income is not enough to meet the income target, they may consider using their assets. This is rarely used, and currently not part of our software. However, for Petitioning sponsors who have significant net assets (assets minus any liabilities on these assets such as debt or mortgage) through the ownership of stocks, bonds, real estate… this is an option. Generally $5,000 in assets is the equivalent of $1,000 of income (different, more favorable rules apply when the applicant is a spouse, minor child, or an alien orphan). Second, when Petitioning sponsors are sponsoring their spouse and when their spouse is already working legally in the United States, then they can consider adding their spouses’ income. This would primarily concern applicants already living in the United States and going through Adjustment of Status (it is then easy to prove to USCIS that spouses’ income will be maintained after they obtain their Green Card, an almost impossible task when spouses move to the United States from abroad). Third, when Petitioning sponsors are not sponsoring their spouse but are married, they can consider adding their spouses’ income. Obviously, spouses need to earn income for it to be helpful, and they need to agree formally to be part of the Affidavit of Support. Beyond their spouses, Petitioning sponsors may consider combining their income with relatives (adult child, parent, or sibling) who live with them. Again, this is rarely used and therefore not part of Immigration Planner’s software. People with whom you combine your income need to be included in the Household Size, which raises the income target! So unless you have a wealthy sibling living with you, it is might be of limited help. If none of the above is enough to meet the income target, then the Petitioning sponsor needs to look for a joint-sponsor. The joint-sponsor accepts to be held jointly liable with the Petitioning sponsor for the support of the family applicant(s). If the first joint-sponsor is unable or unwilling to take financial responsibilities for all the family applicants in the I-130, then the Petitioning sponsor might consider a second joint-sponsor. This step is helping Financial sponsors understand the responsibilities associated with signing an Affidavit of Support. Sponsors signing the Affidavit of Support create a contract between themselves and the U.S. Government where the U.S. Government can consider their income and assets available for the support of applicants. We find it helpful for Financial sponsors to understand their commitment, what it might mean, and when it will end. At Immigration Planner, we try to convey this information through a series of statements that sponsors can read at their leisure. We highlight information that is present in one way or another within Affidavit of Support forms. Financial sponsors must provide applicants any support necessary to maintain their at an income that is at least 125 percent of the Federal Poverty Guidelines for their household size. Financial sponsors must notify U.S. Citizenship and Immigration Services (USCIS) of any change in their address, within 30 days of the change, by filing Form I-865. If Financial sponsors do not provide sufficient support to applicants who become Green Card holders based on the Form I-864 or I-864EZ that Financial sponsors signed, applicants may sue Financial sponsors for this support. Financial sponsors Affidavit of Support obligations end when applicants become U.S. Citizens, or have 40 quarters of Social Security coverage, or are no longer LPRs and departed the United States, or died. Divorces do not end obligations. The forms that need to be completed by Financial sponsor, or sponsors, depend on the ‘Qualifying Path’ chosen. Note that Petitioning sponsors need to file an Affidavit of Support even when they use joint-sponsors. What forms need to be completed depends on the chosen Qualifying Path. Learn from these common scenarios. Petitioning sponsors who meet the income target on their own based only on their income for an I-130 with only one family applicant. Petitioning sponsors file Form I-864EZ. Petitioning sponsors who meet the income target by combining their income with their spouses’ income. Petitioning sponsors file Form I-864, and their spouses Form I-864A. Petitioning sponsors who do not meet the income target and who rely on one joint-sponsor. Petitioning sponsors file Form I-864, and the joint-sponsor Form I-864. Petitioning sponsors who do not meet the income target and who rely on two joint-sponsors. Petitioning sponsors file Form I-864, the first joint-sponsor Form I-864, and the second joint-sponsor Form I-864. Supporting documents vary depending on who is filing the Affidavit of Support, the Qualifying Path chosen, and when in a year the Affidavit of Support is filed. The exact list of Supporting documents vary depending on the Qualifying Path chosen, as well as the answers provided in the Affidavit of Support form(s). It is not possible to establish a ‘generic’ list of Supporting documents and the only way to determine the full, exact list requires the use of a ‘dynamic checklist’, such as the one provided by Immigration Planner. Copy or transcript of the latest Federal Tax Return is included for all Financial sponsors. Proof for all Financial sponsors who are not currently living in the United States that they are ‘domiciled’ in the United States. The Affidavit of Support might trigger more Request for Evidence than may be any other immigration Form. Spot errors and omissions before filing. If there are derivative applicants, make as many copies of the Affidavit of Support as they are applicants. Provide the original Affidavit of Support and supporting documentation with the applicant’s case, and attach copies of the Affidavit of Support (without the supporting documentation) to the case of the derivative applicants. What is the difference between the 'petitioning sponsor' and the 'financial sponsor'? ‘Petitioning sponsors’ are the people who filed Form I-130 on behalf applicants. ‘Financial sponsors’ are the people taking financial responsibilities for the applicant through Affidavit of Support (Form I-864 or I-864EZ). They are often the same people, but they are sometimes different (joint-sponsors). What is the link between Affidavit of Support and 'public charge'? There are two sides of the same coin. Financial sponsors demonstrate that they are able to maintain enough income to support applicants they sponsor through the Affidavit of Support. They are helping convince U.S. Immigration agencies that applicants are not likely to become ‘public charges’ (people who rely on the U.S. government for living expenses). Which income year matters most for Financial sponsors? The income year that matters most is the year in which Financial sponsors sign the Affidavit of Support. So if you file now, what matters most is the anticipated income for 2019, not what happened in 2018. As a result, Financial sponsors taking lower paying jobs, or quitting their jobs altogether, after submitting the Affidavit of Support might not be such a great idea. As a Financial sponsor, how can I use my spouse's income? If you want to use your spouse’s income for an Affidavit of Support for a family member other than your spouse (for instance a child, a parent, or a sibling), then ask your spouse to complete Form I-864A. I am filing multiple I-130s at the same time, what is the impact on household size? None. Zero. For example, a Financial sponsor filing two I-130s for her two parents will have a household of 2 in the Affidavit of Support for her mother (assuming no spouse, no children for the Financial sponsor), and a household of 2 in the Affidavit of support for her father. 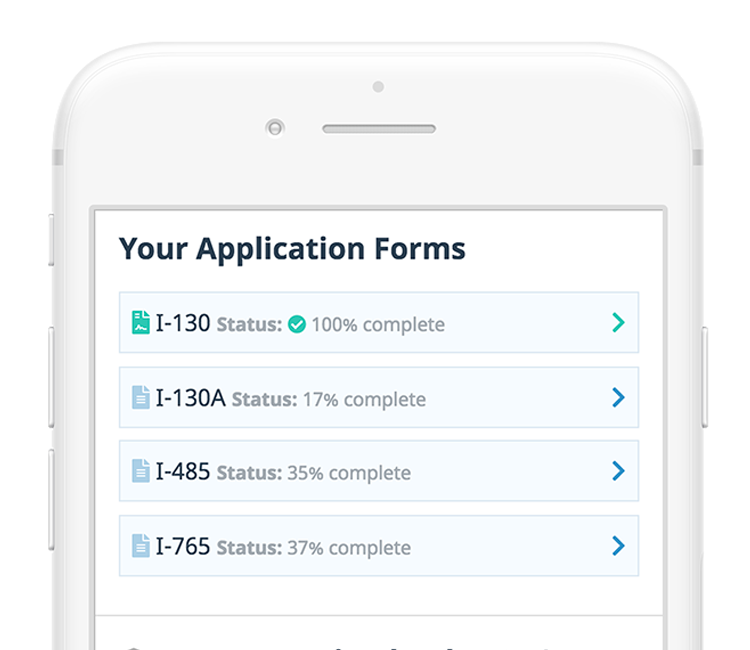 There are 'derivative applicants' on Form I-130. What is the impact on the Affidavit of Support? Derivative applicants (spouses and/or children of applicants eligible under a ‘preference’ classification, not immediate relatives) are counted as part of the ‘Household Size’. Count children who want a Green Card even if you suspect that they might age out and will not be protected by CSPA (Child Status Protection Act) as the final determination about their eligibility can only be made when Principal applicants’ Priority Date becomes ‘current’. Do not count on this Affidavit of Support Derivative applicants who are going to join Principal applicants in more than 6 months. A new, different Affidavit of Support will need to be filed for them. What are the 'three most recent tax years'? As of January 2019, the three most recent tax years are calendar year 2017, calendar year 2016, and calendar year 2015. After April 17th, 2019 (the deadline for filing U.S. taxes), the three most recent tax years will become calendar year 2018, calendar year 2017, and calendar year 2016. I am filing Form I-864EZ, where is my income on my Federal Income Tax Form? For calendar year 2018, you will use the redesigned Form 1040 (2018). There, you will find the ‘adjusted gross income’ line 7. For prior tax years where you might have used Form 1040-EZ, you will find the ‘adjusted gross income’ line 4. I am filing Form I-864, where is my income on my Federal Income Tax Form? For calendar year 2018, you will use the redesigned Form 1040 (2018). There, you will find the ‘total income’ on line 6. For prior tax years where you might have used Form 1040 and will find the ‘total income’ line 22, or Form 1040-A and you will find the ‘total income” line 15. As a Financial sponsor, can I use line items contained in tax 'schedules' to report income? No, U.S. immigration agencies will not let you use tax schedules (such as C or C-EZ for sole proprietorship, D for capital gains and losses, E for rental / royalty income, or F for farm income) by themselves because the profits and losses from these schedules are automatically carried to the front page of the 1040. However, because it is a non-cash expense, you might be allowed to ‘add back’ depreciation expense to the Financial sponsor’s income. What is the difference between a 'copy' of a tax return, or a 'transcript' of a U.S. Federal Tax Return? This impacts the supporting documents: if a copy is provided, the associated W2s and 1099s need to be submitted as well while they are not needed when a transcript is provided. When do I need a joint sponsor? You need a joint sponsor if the the ‘petitioning sponsor’ (the person who filed Form I-130 on behalf of the applicant) does not meet the income requirements based on his or her own income. Do joint-sponsors have to be family members of the applicant? In theory, no. Joint-sponsors do not technically have to be family relatives of applicants. But if there is no obvious link between applicant and joint-sponsor, U.S. immigration agencies might question whether the joint-sponsor will make good on their promise . In other words, if the joint-sponsor is not a family relative of the applicant, it might be wise to explain and document the joint-sponsor’s motivation to care for the applicant. Can joint-sponsors combine their incomes with Petitioning sponsors? No, joint-sponsors cannot combine their income with Petitioning sponsors, nor can they combine their incomes with additional joint-sponsors. I am using a joint-sponsor, does the Petitioning sponsor need to file an Affidavit of Support? Yes. Even Petitioning sponsors who do not meet income requirements have to file Form I-864. And they also need to provide their most recent Federal tax return (or proof that there was no obligation to file). My financial sponsor has not filed U.S. taxes for each of the three most recent tax years, what should I do? You should ask your financial sponsor to file the missing U.S. taxes, even if the deadline to do that has passed (retroactive filing). Unless they have proof that there was no obligation to file, for instance because they were below the minimum income requirements for their age group and marital status (which generally does not make them great financial sponsors…). I received an 'assessment letter' from the National Visa Center (NVC) concerning my Affidavit of Support, what does that mean? This means that the affidavit of support provided contains non-critical errors and omissions. The NVC will transfer the Green Card application to the embassy or consulate. However, the expectation is that the applicant will bring a new affidavit of support at the time of the interview. I received a 'checklist letter' from the National Visa Center (NVC) concerning my Affidavit of Support, what does that mean? The Green Card application process cannot go forward because of mistakes in the Affidavit of Support. A new Affidavit of Support needs to be submitted to the NVC. Why did I receive a Request for Evidence (RFE) about the employment letter provided by an employer? The Financial sponsor is currently residing outside the United States. Is that a problem? Not necessarily. But all Financial sponsors have to prove that they are ‘domiciled’ in the United States through items such as voting records in the United States, records of paying U.S. state or local taxes, having property in the United States, maintaining bank or investment accounts in the United States, having a permanent mailing address in the United States. Why use our smart forms? Check against U.S. immigration rules. Filter the evidence based on your answers. Download and print any time. © 2018 ⎈Immigration Planner. Made with care by Mossettes Technologies.